Find Better Ideas, Faster ® with a custom building trend report, our PRO Dashboard and 80+ categories of premium trend reports. 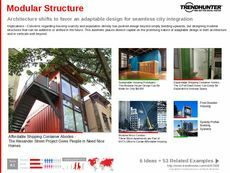 The architecture industry is ever-changing, which makes Trend Hunter’s Building Trend Report a vital tool spotting insights while unveiling the most popular patterns emerging in the industry today. This report explores how both rural and urban environments are involved in the construction of new buildings and facilities to account for the growing population. 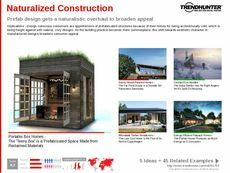 The report explains the routes that construction companies are using to erect these buildings while looking at materials, sustainability and space. This report will provide construction companies with exceptional information that will aid in progression within the development industry. Environmentalists, building material suppliers as well as those working in landscaping and related trades industries will also find use in this report. When creating new housing developments and erecting new facilities, the Building Trend Report will equip you with meaningful information that will ensure you continue to meet strict costumer demands.